Mother and daughter duo, Kristin Reilly and Pamela Morris, teamed up to remind families what true Christmas spirit can mean in our lives. The average American spends approximately $700 preparing for Christmas and the holiday season, but often the presents that cost the least end up meaning the most. Reilly decided to bring to life a story she and her mother had penned together years ago for a grade school assignment, as a Christmas surprise this year. With decades of experience working as an educator, Pamela Morris instilled a love of writing in her daughter from a young age. The story is a Christmas classic, brought to life through vivid illustrations. 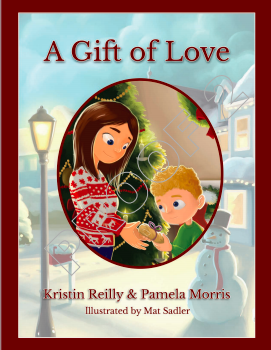 According to the authors, “A Gift of Love” is inspired by love and the power of giving. “I want readers to remember the spirit of the holidays and what they represent—the joy that it brings to people,” says Reilly. People often get so busy around the holidays, that they forget to enjoy the simplicity of spending time with family. Bringing back true Christmas spirit—and taking a break from our hectic lives—is an important lesson to apply in our lives regardless of the season. “I hope that during this busy time, people will remember to spend time with their loved ones, to volunteer, and to bring this feeling of love and joy into their day to day lives,” adds Reilly. For more information about Kristin Reilly and Pamela Morris visit www.halopublishing.com. “A Gift of Love” is now available at Halo Publishing International, Amazon, Barnes and Noble, Goodreads, and Books a Million in Paperback, Hardcover, and as an e-Book.